Asahi Shinbun newspaper recently interviewed Satoru Iwata CEO of Nintendo and had some very interesting tidbits. I'm not sure if I'm more excited for Zelda or for the DS2 at this point. Probably once they show that first trailer for Zelda I'll end up having my mind made. Exciting news for sure. 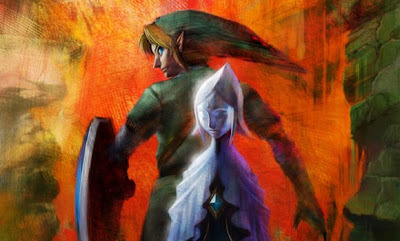 Super Mario Galaxy 2, Metroid: Other M, and the new Legend of Zelda game? 2010 may be another great year for Nintendo. I hope we'll find out more about these games before this years E3 because there haven't been anything since last year. I can't believe it I read this and my heart dropped all my money is going towards reserving and pre-ordering zelda, mario and metroid!!!!!!!!!!!!!!!!!!!!!!! "zelda 2010 IN JAPAN GUYS"
This doesn't happen too often. Nintendo usually releases a Zelda game really close to the Japan release date in the states. Probably within a 2 month span of each other. They are probably translating the game as they go. CAPCOM HAVE JUST OPENLY SLANDERED THE ENTIRE Wii USER-BASE.......!!!!!!! only 1 day after NINTENDO promised MH3 support in the west CAPCOM called the wii and all of its customers THIS IS INSANE the games industry is killing its self and blaming US!!! Why are you so unstable? You're asking that question to a person who frequently abuses the "caps lock" key. I wonder how many keyboards he's went through after smashing it with his fist in frustration. What's worse: Caps lock boy or exclamation point boy? Is Retro developing this game? The next installment is being handled by Nintendo's internal team, not Retro Studios. Hope that Eiji Aonuma have enough time to polish new Zelda. If the game will have voice acting it wont be released this year outside Japan. Speaking of Retro Studios, let's not forget their new game should be out this year. You can add that to the list for 2010. Ummm; a Nintendo of America spokesperson has stated that no HD Nintendo DS with motion control is in development for sale; and that Iwata's statement was translated incorrectly. And quite frankly I don't blame them. The last thing Nintendo needs is a DS with motion controls simply because it would basically create a handheld Wii which would hurt Wii sales simply because people would see the DS2 as good enough. It would eliminate the monmentium Wii worked so hard to built after the failures of Gamecube and N64. As for Capcom France PR: Go to hell you sick freak! We buy what we want; on our time when we have the MON-EY! Blaming us for creating a crappy title is not only stupid but business suicide. Then again; I would expect nothing less from companies who didn't want Wii to succeed. Heck; Capcom's support for DS isn't so hot either.